This weekend, comiXology — the world’s largest digital comics platform available on iPhone, iPad, Android, Kindle Fire and the Web with over 60 million comic and graphic novel downloads to date — returns to McCormick Place, Chicago for the Chicago Comics & Entertainment Expo 2012 (C2E2) giving away free digital comic codes for The Walking Dead Vol. 1 at their booth (#522) during this year's C2E2 taking place from April 13th - 15th. Following the wildly popular promotional giveaways at WonderCon ‘12 and Emerald City Comicon ‘12 last month, comiXology is teaming up once again with The Walking Dead creator Robert Kirkman’s Skybound, to make C2E2 ’12 unforgettable for comic fans by giving them a free “taste” of the first graphic novel — regularly $8.99 for 140 pages — that the hit The Walking Dead TV show is based on. 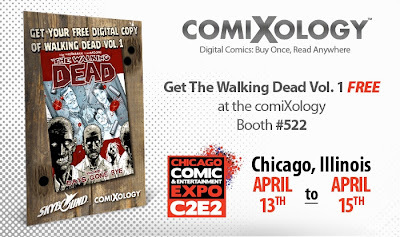 The first 2,500 C2E2 ‘12 attendees to come by comiXology’s booth (#522) will receive a limited edition promotional postcard imprinted with a unique download code redeemable for The Walking Dead Vol. 1 exclusively on comiXology.com in exchange for an email sign up. In addition to the must-have The Walking Dead Vol. 1 giveaway, comiXology will be providing hands on demonstrations of the Comics by comiXology digital comics platform at their booth all weekend long. Comic fans should not miss their chance to get a look at the all new 3.1 iOS upgrade that includes the CMX-HD digital comics format for the new iPad. All C2E2 ’12 attendees are invited to attend the special “ComiXology Open Discussion Panel” where comiXology co-founder and CEO David Steinberger will answer questions from the audience on “Everything Digital” with no topic off limits. The “ComiXology Open Discussion: Everything Digital Panel” will be on Friday, April 13th from 5:15pm- 6:15pm in Room N426b. Giveaway: Limited edition promotional postcard imprinted with a unique download code redeemable for The Walking Dead Vol. 1 exclusively on comiXology.com in exchange for an email sign up. Panel: Friday, April 13th from 5:15pm – 6:15pm – ComiXology Open Discussion: Everything Digital Panel with comiXology’s David Steinberger – Room N426b.